The Temple of Portunus is a well preserved late second or early first century B.C.E. rectangular temple in Rome, Italy. Its dedication to the God Portunus—a divinity associated with livestock, keys, and harbors—is fitting given the building’s topographical position near the ancient river harbor of the city of Rome. 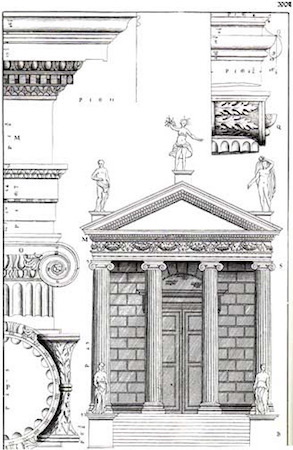 The city of Rome during its Republican phase was characterized, in part, by monumental architectural dedications made by leading, elite citizens, often in connection with key political or military accomplishments. Temples were a particularly popular choice in this category given their visibility and their utility for public events both sacred and secular. Temple attributed to Herakles Victor, Forum Boarium, Rome, late 2nd century B.C.E. 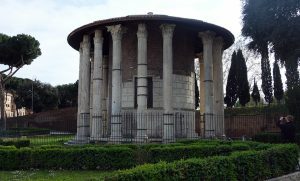 The Temple of Portunus is located adjacent to a circular temple of the Corinthian order, now attributed to Herakles Victor. The assignation of the Temple of Portunus has been debated by scholars, with some referring to the temple as belonging to Fortuna Virilis (an aspect of the God Fortuna). This is now a minority view. The festival in honor of Portunus (the Portunalia) was celebrated on 17 August. The temple has a rectangular footprint, measuring roughly 10.5 x 19 meters (36 x 62 Roman feet). 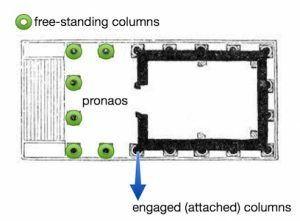 Its plan may be referred to as pseudoperipteral, instead of a having a free-standing colonnade, or row of columns, on all four sides, the temple instead only has free-standing columns on its facade with engaged columns on its flanks and rear. The pronoas (porch) of the temple supports an Ionic colonnade measuring four columns across by two columns deep, with the columns carved from travertine. The Ionic order can be most easily seen in the scroll-shaped capitals.There are five engaged columns on each side, and four across the back. Overall the building has a composite structure, with both travertine and tufa being used for the superstructure (tufa is a type of stone consisting of consolidated volcanic ash, and travertine is a form of limestone). A stucco coating would have been applied to the tufa, giving it an appearance closer to that of the travertine. The temple’s design incorporates elements from several architectural traditions. 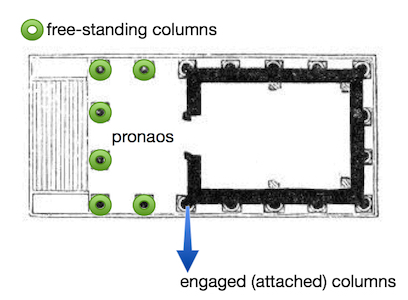 From the Italic tradition it takes its high podium (one ascends stairs to enter the pronaos), and strong frontality. 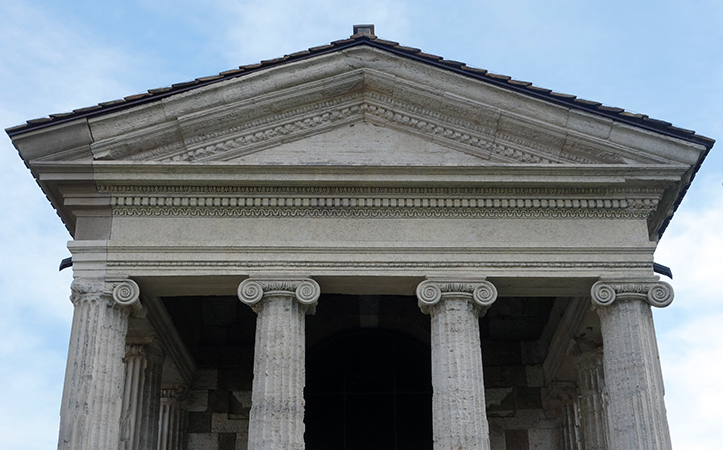 From Hellenistic architecture comes the Ionic order columns, the engaged pilasters and columns. The use of permanent building materials, stone (as opposed to the Italic custom of superstructures in wood, terracotta, and mudbrick), also reflects changing practices. 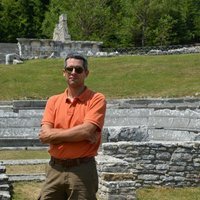 The temple itself represents the changing realities and shifting cultural landscape of the Mediterranean world at the close of the first millennium B.C.E. 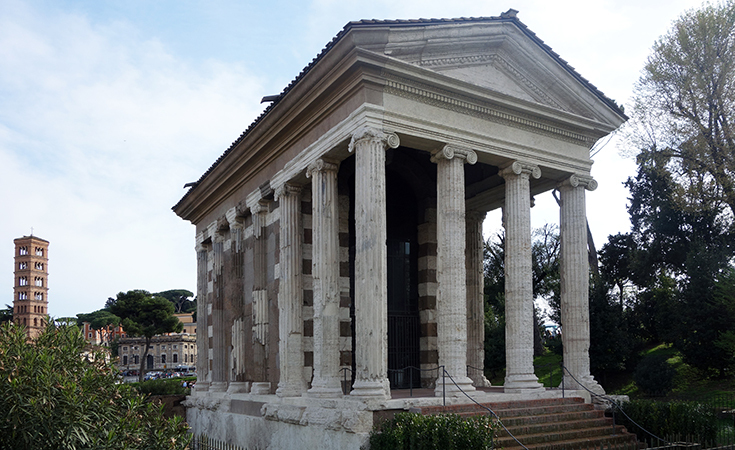 The temple of Portunus resides on the Forum Boarium, a public space that was the site of the primary harbor of Rome. While the temple of Portunus is a bit smaller than other temples in the Forum Boarium and the adjacent Forum Holitorium, it fits into a general typology of Late Republican temple building. The temple of Portunus finds perhaps its closest contemporary parallel in the Temple of the Sibyl at Tibur (modern Tivoli) which dates c. 150-125 B.C.E. 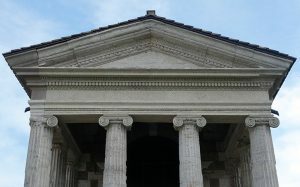 The temple type embodied by the Temple of Portunus may also be found in Iulio-Claudian temple buildings such as the Maison Carrée at Nîmes in southern France. 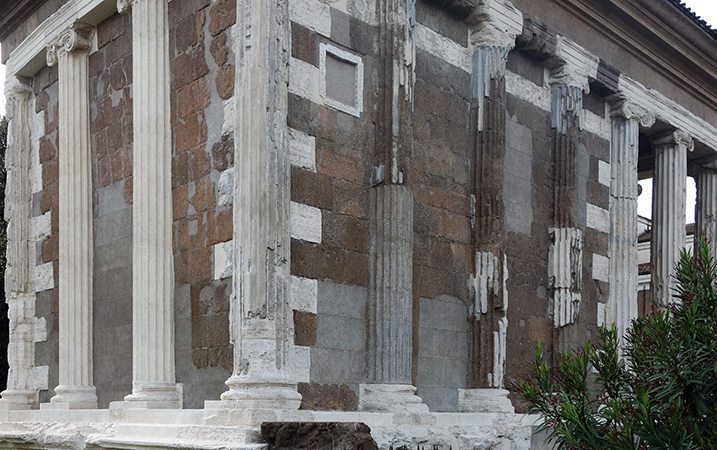 The Temple of Portunus is obviously in an excellent state of preservation. In 872 C.E. the ancient temple was re-dedicated as a Christian shrine sacred to Santa Maria Egyziaca (Saint Mary of Egypt), leading to the preservation of the structure. The architecture has inspired many artists and architects over the centuries, including Andrea Palladio who studied the structure in the sixteenth century. 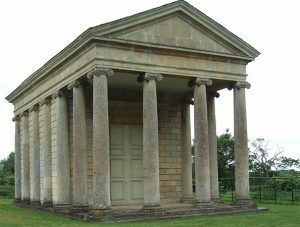 Neo-Classical architects were inspired by the form of the Temple of Portunus and it led to the construction of the Temple of Harmony, a folly in Somerset, England, dating to 1767 (below). The Temple of Portunus is important not only for its well preserved architecture and the inspiration that architecture has fostered, but also as a reminder of what the built landscape of Rome was once like – dotted with temples large and small that became foci of a great deal of activity in the life of the city. 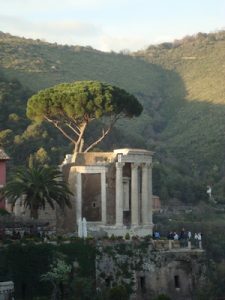 Those temples that survive are reminders of that vibrancy as well as of the architectural traditions of the Romans themselves. F. Coarelli, Il Foro Boario dalle origini alla fine della repubblica (Rome: Ed. Quasar, 1988). R. Delbrueck, Hellenistische bauten in Latium (Strassburg, K.J. Trübner, 1907-12). E. Fiechter, “Der Ionische Tempel am Ponte Rotto in Rom,” Mitteilungen des Deutschen Archaeologischen Instituts, Römische Abteilung 21 (1906), pp. 220-79. J. W. Stamper, The Architecture of Roman Temples: The Republic to the Middle Empire (Cambridge: Cambridge University Press, 2008). A. Ziółkowski, The temples of Mid-Republican Rome and their historical and topographical context (Rome: “L’Erma” di Bretschneider, 1992).